David Shepherd awakes in a cell. The middle-aged London cab driver has vague recollections of attempting to protect his female passenger from a gang of drunken youths. Patchy flash-backs of blood and screams leave him with the ominous feeling that he may have done something rather quite rash. Did he kill one of the attackers? This question is answered by the matter-of-fact Olivia, who assures him that this isn't jail and that David hasn't murdered anyone. His relief is short-lived when Olivia also reveals herself to be an Angel and that David is, in fact, in Purgatory. It appears that there was one fatality the previous night: him. And so begins the Trial of David Shepherd in the Court of Saint Peter. A court that is presided over by Angels, prosecuted by Demons and ultimately judged by a soul's adherence to the Ten Commandments. 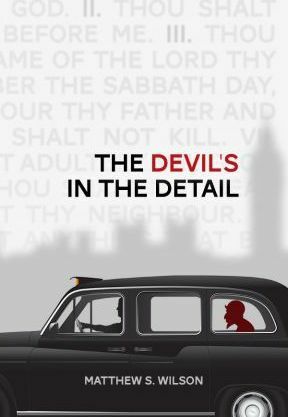 The Devil's in the Detail is a religious satire, for atheists, agnostics and believers alike. It poses questions that we will all one day ponder: How are the actions we take in this life, ultimately judged? What constitutes a good life? What does it really take to pass through the Pearly Gates? As David tries to answer these questions he will discover that sometimes... The Devil's in the Detail.